The Deluxe Line Markers from Champion Sports have a unique feed system that continuously churns material for a steady flow for smooth field lines and allows the operator to keep moving instead of mixing the material by hand. Choose from 3 models: 10 lb, 35 lb or 50 lb capacity. The Rhino Series Catcher's Shin Guards from Champion Sports have a super soft removable and washable Coolmax® inner comfort lining that wicks away moisture. These leg guards have ventilation portals to maximize weight reduction and cooling, and an air bladder kneecap for increased comfort. The ultra form fitting design insures maximum protective coverage. Available in adult, intermediate and youth sizes, in 5 different colors. These white plastic golf balls from Champion Sports come in a retail pack of 12. Great for golf or baseball training in the backyard. 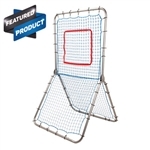 The Save a Leg Throw Down Base from Champion Sports is a basic throw down portable base. Great for backyard or recreational use. The Indoor / Outdoor Base Set from Champion Sports is a set of orange vinyl throw down bases along with a home plate and a pitching rubber. Portable and lightweight, these are great for backyard or recreational use. The Waffle Bottom Home Plate from Champion Sports is an official size, throw down portable home plate. This basic home plate is great for backyard or recreational use. Champion OLBS Official League Baseballs have a syntex leather cover and a rubber/cork core. Nylon Winding and Raised Seams. Item #OLBS. The Baseball Backpack from Champion Sports features two bat holders, glove and helmet pockets, drink sleeve and a large main chamber. Adjustable shoulder and back strap with shoe and cleat compartment. 17" H by 14" W by 10" D.
These are the White Dimpled Pitching Machine Balls from Champion Sports. Made of a plastic and vinyl composite. Perfect for use with any standard baseball pitching machine. The Official Tee Balls from Champion Sports are soft compression baseballs for younger players. Choose from 3 models: Level 1 (Ages 5-7), Level 5 (Ages 7-10), and Level 10 (Ages 10+). Item #s BSC1, BSC4 and BSC5. This Deluxe Batting Tee from Champion Sports is mounted on an official rubber homeplate. Its telescopic sleeve adjusts from 22" to 36" to accommodate batters of all sizes. The Hanging Helmet Bag from Champion Sports holds 8 helmets in individual mesh pockets. Folds up for secure transport with carrying handles. Champion OLB1 Official League Baseballs have a premium leather cover and a rubber/cork core. Polyester Winding and Raised Seams. Item #OLB1. Champion OLB5 Official League Baseballs have a Full Grain Cowhide leather cover and a rubber/cork core. Polyester Winding and Raised Seams. Item #OLB5. The Combination Baseball Bat & Helmet Fence Bag from Champion Sports holds 6 bats and 6 helmets and rolls into a carrying bag for storage and transport. Dimensions: 36" x 20" x 11". Champion OLB10 Official League Baseballs have a premium cowhide leather cover and Double cushioned cork center. 3-Ply Grey Wool Yarn Winding and Raised Seams. Item #OLB10. The Rhino Series Catcher's Shin Guards from Champion Sports have a super soft removable and washable Coolmax® inner comfort lining that wicks away moisture. These leg guards have ventilation portals to maximize weight reduction and cooling, and an air bladder kneecap for increased comfort. The ultra form fitting design insures maximum protective coverage. Available in intermediate and youth sizes FREE SHIPPING! These are the RHINO 11" Synthetic Leather Fastpitch Softballs (Poly core) from Champion Sports. 11" Optic yellow synthetic leather cover. Red stitching, .47 Poly Core, medium compression and raised seams. Item #SB147YS. These RHINO 11" Fastpitch Softballs from Champion Sports are the same as the SB111L Leather Softballs, but with a synthetic cover for a more cost-effective softball. 11" Optic yellow syntex cover, Red stitching, .47 Cork Core, medium compression and raised seams. Item #SB11. These RHINO 11" Fastpitch Softballs from Champion Sports are white with a syntex cover. Red stitching, .44 Poly Core, medium compression and raised seams. Item #SBC11. Champion Safety Softballs are a good choice for practice, training drills, or for youth leagues. They have a synthetic leather cover and a sponge rubber core. Available in 11" and 12" sizes. Item #s ST11 and ST12. These are the RHINO 12" Synthetic Leather Fastpitch Softballs (Poly core) from Champion Sports. NFHS Approved, 12" Optic yellow synthetic leather cover. Red stitching, .47 Poly Core, medium compression and raised seams. Item #SB47YS. These are the Dimpled Pitching Machine Softballs from Champion Sports. Made of a plastic and vinyl composite. Perfect for use with any standard softball pitching machine. Choose from 11" or 12" sizes, in Yellow or Optic Yellow color. Set of 3 basic foam filled quilted cover bases from Champion Sports. Heavy duty nylon quilted cover, includes straps and spikes. 15" x 15" x 3". The Multi Position Batting Tee from Champion Sports has a rotating multi-position gear that works great for practice hitting various pitch locations. The adjustable ball holder extends from 21" to 37" and accommodates batters of all sizes. The Portfolio Hanging Bat Bag from Champion Sports holds 8 bats in individual pockets. Zippered nylon case with carrying handle that folds in two. FREE SHIPPING! This Weighted Baseball Training Set from Champion Sports includes 9 balls that are weighted from 4 oz to 12 oz. Same feel as a regular baseball, with graduated color coded weights. Comes with nylon carrying case. These are the RHINO 11" Leather Fastpitch Softballs from Champion Sports. NFHS Approved, 11" Optic yellow leather cover. Red stitching, .47 Cork Core, medium compression and raised seams. Item #SB111L. These RHINO 11" Leather Fastpitch Softballs from Champion Sports are NFHS Approved. White Leather cover with Red stitching, .44 Poly Core, medium compression and raised seams. Item #SBC11L. These are the RHINO 12" Leather Fastpitch Softballs from Champion Sports. These are high quality softballs for fastpitch game and practice use. NFHS Approved, 12" Optic yellow leather cover. Red stitching, .47 Cork Core, medium compression and raised seams. Item #SB112L. This Deluxe multi-position batting tee from Champion Sports is Pro quality injection molded and has a 17" home plate with 5 different batting sections. Comes with 2 adjustable ball holders that extend from 20" to 36", and has a Steel reinforced carrying handle. These are the RHINO 12" Leather Fastpitch Softballs (Poly core) from Champion Sports. High quality softballs for fastpitch game and practice use. NFHS Approved, 12" Optic yellow leather cover. Red stitching, .47 Poly Core, medium compression and raised seams. Item #SB47NF. The Wheeled Team Equipment Bag from Champion Sports is an extra large baseball equipment bag that features Wheel design for easy transport, heavy duty zippers and hardware, and an extra large main compartment. Dimensions: 38" L by 16" W by 18" H.
These are the RHINO 11" Leather Fastpitch Softballs (Poly core) from Champion Sports. High quality softballs for fastpitch game and practice use. NFHS Approved, 11" Optic yellow leather cover. Red stitching, .47 Poly Core, medium compression and raised seams. Item #SB147NF. The Pro Anchor Home Plate from Champion Sports is a professional homeplate with ground anchor and black beveled edges for safety. Includes galvanized steel ground anchor. The Pro Bury All Home Plate from Champion Sports is an official size, three inch high in-ground home plate. All rubber waffle bottom, with black beveled edges. Designed to be buried flush with the ground. The Universal Home Plate from Champion Sports is a high quality plate that comes with anchor and 5 spikes, and is made of white/black molded rubber with a metal bottom. This set of pro anchored bases from Champion Sports has a heavy gauge rubber cover over a high density foam interior. 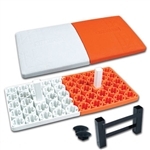 Set includes 3 bases, 3 anchors and 3 plugs. This set of breakaway bases from Champion Sports has a quick release base that disengages from its stationary rubber base plate upon impact. Easily installs in standard ground anchors. New magnetic Break-Free bases from Champion Sports - complete base includes base cover, stanchion pan, ground inserts & 3 interchangeable plates to adjust holding strength. Fully compliant with Little League Rule 1.06. 15" x 15" x 2 1/4".